How can the IG stoop so low? why should the FG plan on using thugs to implicate me! Bukola Saraki. 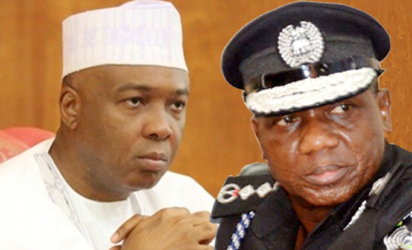 Speaking at plenary Wednesday,President of the Senate, Dr. Bukola Saraki, has accused the Inspector General of Police (IG), Mr. Ibrahim Idris, of plotting to implicate him in criminal activities. Saraki said he was informed by the Kwara State Governor, Mr. Abdulfatah Ahmed, that the IG directed that some cultists, who were arrested in the state, be transferred to Abuja. The plot he said is to get them to alter their statements already taken in Kwara State. They would then be made to implicate the Kwara State Government and myself in their new statement. The matter is currently being discussed at the Senate as Saraki later stepped down for the deputy Senate President, Ike Ekweremadu to preside for the constitution of an ad-hoc Committee to look into the matter, the senate described this as very serious and grievous.